Mongo and Dad went up to the Cooke Canyon Hunt Club to finish the pheasant hunting season. Mongo and Dad had enjoyed a fiarly good hunting season. They had limited out on ducks in January, and while their pheasant hunts on public lands had been less than stellar ( i.e. zero birds), they had done well at their previous hunt at Cooke Canyon. However, today was another day. It’ a good thing that this trip was designed to be an adventure, because that is certainly what it has become. Hudo is back in the garage, getting another major repair. Heidi has had to order a new set of pistons and connecting rods. Last picture posted before theft. And while she is waiting the rebuild, Heidi’s handbag, with her passport, money, credit cards, address book, calendar, diary, iPad and iPhone were stolen! 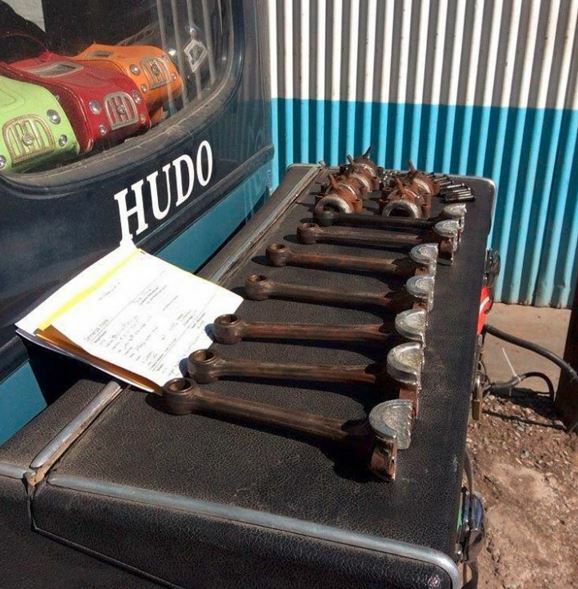 We hope the mechanics can get Hudo on the road again soon. And our sympathies extend to Heidi for all her lost treasures. Electronics can be replaced, but stolen memories are irreplaceable. It was mid-winter. The time of year in the Pacific Northwest when the days are very short. It was dark when Dad took Mongo out for morning walks, and dark when he took him out for evening walks. On one of these short dark days, Mongo found the door to the pantry slightly ajar. For Mongo, this is always an open invitation for noshing. The first thing to catch his interest that day was a five pound bag of rice. Eating five pounds of rice actually takes longer than one might think. It is a lot of rice, even for Mongo. It turned out to be a whole day affair.